A smoking-gun demonstration of how the formerly great reporter trims his sails according to the power politics of the moment. 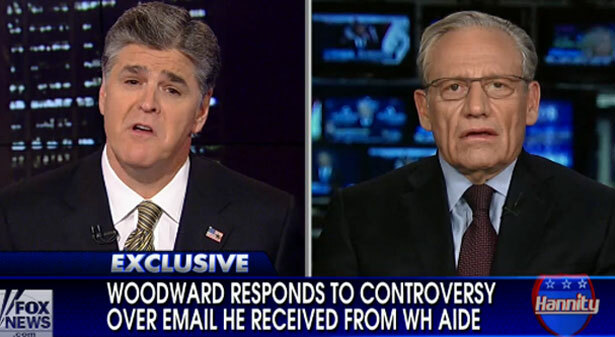 Bob Woodward discusses the White House “threat” with Sean Hannity on Fox News. This business with Bob Woodward—the White House’s Gene Sperling told him he might “regret” making a certain claim blaming Obama for the sequester debacle; Woodward told Politico he heard that as a veiled threat; conservatives crowed that all this proved Obama has lapped even Richard Nixon as a political thug; then the actual full exchange with Sperling, when it came forth, made it painfully obvious that the offending words were about as threatening as a light misting rain on a warm summer night—reveal most of what you need to know about Bob Woodward’s usefulness these days as a guide to how Washington works. That is to say, he is utterly useless in explaining how Washington works. But he is almost uniquely useful as an object lesson in displaying how Washington works—especially its elite punditry division. They ran it anyway, of course. They ran it even though Richard Nixon’s re-election juggernaut was proving impermeable to Woodward and Bernstein’s ongoing Watergate full-court press, and many among Georgetown’s cocktail set had begun to consider the Post’s ongoing indulgence of the story a bit of an embarrassing obsession, kind of the way a blogger like Glenn Greenwald is looked upon now. Because back then, Woodward had guts. He’s something different now: a barometer of Washington conventional wisdom, who more appears to say what he chooses to say based upon his continually evolving sense of who is up and who is down among precisely that same Georgetown cocktail set. Call it the middle volume in a Goldilocks series: not too fulsome, not too mean, just something a little bit in between—just right: after all, his presidential approval ratings were hovering all that year right around 50 percent. Then came 2006, the collapse of the Iraq adventure, and a president down below 40 percent in the ratings, roundly derided in all the right circles as a miserable failure. The book Woodward published that year—subtitle: “Bush at War, Part III”—was called State of Denial, and depicted a dangerous idiot. So I did some A/B/C comparisons: Woodward in 2002, 2004 and 2006, characterizing the same subject in completely different ways, correlated in every instance with his declining muscle in Washington. Then, to put it in appropriately Watergate language, I found what I consider smoking-gun proof that all this is power worship far more than it is journalism. As I wrote, “The two most recent books end with the same interview: Mr. Woodward’s several hours with the President on Dec. 10 and 11, 2003. Both books contain the same exchange: Mr. Woodward says, ‘But we have not found any weapons of mass destruction,’ and Mr. Bush replies, ‘We have found weapons programs that could be reconstituted.’ ” The two books continue in almost identical wording, Woodward describing himself telling the president he’d been “travel[ing] around the country,” discovering Americans found him (note the diplomatic construction) “less the voice of realism” than previously for not acknowledging the non-presence of WMD. But the 2004 and 2006 versions end with him characterizing the same interview entirely differently. “True, true, true,” the president is quoted as saying in Plan of Attack. Mr. Woodward then offers this paraphrase of what Bush said next: “He contended that they had found enough.” That line, in 2004, “He contended that they had found enough,” comes off as Woodwardian self-criticism: the last word belongs to the president, turning the reporter into a quisling who would happily leave a dictator in power because he only had a little bit of weapons of mass destruction. In 2006, however, gives himself the last word, as an internal dialogue: “It had taken five minutes and 18 seconds for Bush simply to acknowledge the fact that we hadn’t found weapons of mass destruction.” It completely changes the meaning of the very same discussion: the man who came off as a steely protector of the nation when he was up above 50 percent in the approval ratings has suddenly become feckless now that he was below 40. Woodward claimed in an interview he had just been following the facts as they were revealed to him: “It took me over two years to find out what happened, and quite frankly, as I say as directly as can be said in English, they have not been telling the truth about what Iraq has become.” But as I wrote in 2006, doesn’t precisely that shifting perspective indict itself? “If Part III is the better book because it’s a more accurate portrayal of the Bush administration’s abject failures and inadequacies, doesn’t that make the author look worse? What was he withholding?” For instance the word “Bandar,” a central figure in Part III—or “Bandar Bush,” ran the nickname with which GWB tagged him in tribute to the intimacy of their relationship—doesn’t appear in Volume I. That intimacy apparently wasn’t something Washington polite opinion cared that you knew about in 2002. A state of denial, you might say. Continue reading Bob Woodward. But not the prose. You won’t learn much from that. Read the man instead. That way you’ll learn what the people in power think about what you’re supposed to think. Right-wing TV had a field day with Woodward and his White House “threat,” even though it may all just be a ploy by Woodward to sell more books, Leslie Savan writes.